Church policies shaped by the Gospel will reflect the Gospel, exhibiting the power of God, not legalism or bureaucracy that holds us back and boxes us in. We need a consistency between the message we proclaim and the policies we propose. 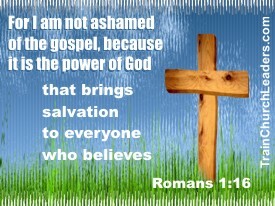 Why should people believe the Gospel is the power of God (Rom. 1:16) if it makes little difference in the way we function? 1) Policies must promote life-giving standards and structures. The Gospel results in life (Jn. 3:16). Because of the Gospel, we moved from death to life (Jn. 5:24). We must guard against letting our policies pull us away from the fullness of life in Him (Jn. 10:10), back into a lifeless existence of merely going through the motions and not truly living. Take time to examine if a policy is truly needed, and if so, how to develop it in a way that promotes life-giving ministry over mere conformity. 2) Policies must leave room for faith. Righteousness, or right-living, must not be about us striving on our own to do what He should be doing in us. “For in the gospel the righteousness of God is revealed – a righteousness that is by faith …” (Rom. 1:17). We must not let policies box us in and prevent us from trusting in the Lord. Take time to prayerfully and carefully word policies so they truly reflect our need for God to be at work in and through us. 3) Policies must demonstrate compassion and concern for people. “But God demonstrates his own love for us in this: While we were still sinners, Christ died for us.” (Rom. 5:8) – Remember, God so loved the world (people) that He sent Jesus (Jn. 3:16). When policies take on a life of their own, we become more concerned about protecting our rules and regulations or our programs and structures, than being compelled by love for people (2 Cor. 5:14). Take to time to regularly revisit our primary purpose to love God and love people so policies and how they’re enforced reflect God’s motivations as seen in the Gospel.